Custom PVC zipper pulls can be made in any shape or size or you can opt to use our common sizes on the price sheet. 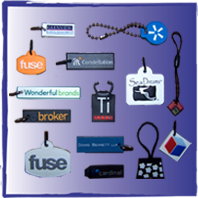 Custom zipper pulls are a great way to promote your business. Custom zipper pulls are designed to customize jackets, hoodies, book bags and even pants. The images below are just some of the many custom zipper pulls FlexSystems has produced for our customers. We would enjoy the opportunity to submit a quote for your custom zipper pulls today.